Waheguru Ji Ka Khalsa Waheguru Ji Ki Fateh. Hukamnama today is by Guru Ram Daas Ji, in Jaitsaree Raag on Ang 697 of Sri Guru Granth Sahib Ji. Today’s Shabad from Sri Guru Ram Daas Sahib Ji and this is again in Jatsaree Raag. Now we talked about this Jaitsaree Raag yesterday and the intensity and the gravity of Jaitsaree Raag is such that you are completely absorbed into the weight of the Raag, the power this Raag carries. I recommend you find a Shabad in Jaitsaree Raag and listen to the Raag and see yourself what impact this Raag has on you. Guru Ji says in first line of this Raag jin har hirdai naam na basi-o - those people jin har hirdai; hirdai - means inside your heart, inside the very center of your soul; those people who do not have the Lord’s name inside their heart, inside their soul, tin maat keejai har baanjhaa - their mothers should have remained sterile. Now this comes as a big shock to many people that Guru Sahib Ji could say this. But what Guru Sahib JI is saying here is that the whole idea of us being on this earth is for us to merge back in with the creator soul. If we do not take this task upon us our lives are wasted. And the lives of those people around us will be affected by our energies are wasted as well. sunjee - means a wasted, abandoned, sort of deserted place. Guru Ji says without the Naam, without the name of God, without the love of God inside us, we have this empty space that can never be filled. We try to fill it with cars, with money, we try to fill it with all the material goods but this cannot happen. tin sunjee dayh fireh bin naavai - We just walk around, o-ay khap khap mu-ay karaanjhaa; khap khap - is to talk needlessly. mu-ay karaanjhaa- they cry out and talk needlessly. bin naavai - without the Naam, we walk around attached, we walk around in a greed, we walk around in lust, we walk around in ego, but Guru Ji is saying if you were just to take the Naam and be blessed with the Naam all of these things would go. the word maajhaa here in this line means within you, within the center of your heart. mayray man O my mind, jap - chant, meditate, love, become one with; raam naam har means name of the Lord. Maharaj ji says, har har kirpaal; kirpaal means the merciful, one who is full of kindness. Don’t think because of the first lines of the Shabad, Guru Ji is saying the Lord is not full of kindness, Guru Ji used the first two lines of the Shabad to wake us up. To say, look, don’t waste your life, chant the name of the Lord. har har kirpaal kirpaa parabh Dhaaree -the merciful, Har, Lord, kirpaa parabh Dhaaree -he has showered me with his mercy. gur gi-aan dee-o man samjhaa; gi-aan - is spiritual knowledge, gur gi-aan Guru has blessed me with this spiritual knowledge - dee-o given, man samjhaa and my mind has understood it. rahaa-o pause and think about this. Guru Ji is giving us this spiritual knowledge now through this Hukamnama. Pause and think about this. Maharaj Ji says in this kaljug - in this age of darkness around us; kal jug - dark age; har keerat kaljug pad ootam; pad means level or status, ootam means high. The keerat praising of the Lord, the spiritual experience received through praising of the Lord through meditation, through prayer, through Keertan, is the highest thing in this dark age. har paa-ee-ai satgur maajhaa You will find har - God from the very center of the Guru. maajhaa meaning middle, center again. So through Keertan, through praising God, through singing those praises you will find God from the very center of the Guru. ha-o balihaaree - I am a sacrifice, satgur to my Guru, apunay, jin gupat naam pargaajhaa; gupat meaning hidden name, because the name Naam is within us all, the Shabad is within us all. The Guru is the one that reveals it to us. And Guru Ji says I am a sacrifice to my true Guru who revealed this hidden name which was inside me, because the treasure has always been inside us. pio daday ka khol ditha khajaana tau maray man bhi-aa nidhaana I opened up Guru Ji says in his Banee, I opened up the treasure of my ancestors which lay hidden inside me; which is the Naam and then I was filled with the spiritual ecstasy. darsan - the blessed vision, of holy people - saaDh; mili-o - is given to those, who have great fortune - vadbhaagee; sabh kilbikh - all their sins, all their pains; gaay gavaajhaa - are removed. gavaajhaa is taken away, removed. satgur - The true Guru, saahu - the true king, the great king; paa-i-aa vad daanaa - I have found this true king. vad daanaa means the one who knows everything. daanaa means the one knows all. har kee-ay baho gun saajhaa- what the Guru has done in his great virtue is explain to me the glories of the Lord, he has explained to me the path of truth, which he is doing now through his Hukamnama. 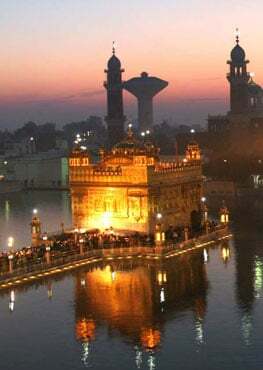 jin ka-o kirpaa Those upon who the grace; karee jagjeevan - Lord, Waheguru, the one who brings life to the world, upon whom he has showered his grace; har ur Dhaari-o man maajhaa - means to take - ur Dhaari-o - means to take within oneself, man maajhaa means right into the center of the mind, right into the center of the soul. Those people upon who the God, the Guru has showered their grace, only they are the ones who can cherish the name. Only they are the ones who can behold him in their hearts. Dharam raa-ay The righteous judge in the court of the Lord, dar - at the court of the Lord, kaagad faaray; kaagad - literally means paper and faaray means to rip up. jan naanak laykhaa samjhaa This means the righteous judge of Dharmaa at the court of the Lord, he literally tears up the karmic papers of the people who are imbued with God’s love. Because servant Nanak’s account has been settled by the Guru himself. Karma, the only way to wipe away Karma and to do such Karma and to do such actions which brings us out of Karma is to meditate upon the Lord Har and to follow the Guru’s path. karam karat hovay neh karam tis baisano ka nirmal Dharam But this can only happen with the Guru’s Kirpa. The Guru has tried to wake us up in this Hukamnama and we must with his grace, with his blessings we have been blessed with this Hukamnama and with his blessings may we follow this Hukamnama. I leave you with Raha-o lines again.